Now available in Traditional Chinese, Simplified Chinese, Korean and Thai! So I'm an avid simulation game player and I used to love sim tower when I was younger so I decided to give this game a try. Well it wasn't very long before I was completely hooked on it. 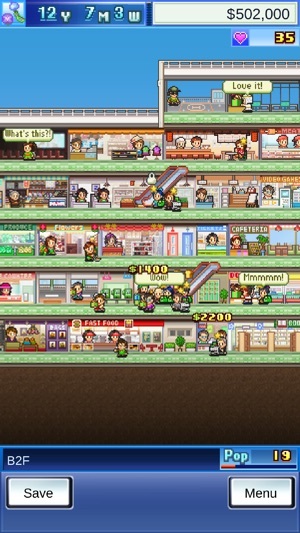 Mega mall story is a wonderful tower/store simulation game. There are a large variety of stores and facilities that you can build and many different types of customers to serve. The graphics are cute and colorful and game's UI is very easy to use. I've been playing it for hours at a time. One again Kairo has delivered a delightfully complex yet easy to understand sim game that you can play over and over again and without those infuriating in-app purchases that most games require you to buy to fully enjoy the experience. Well worth the $5 price. My only wish is that the devs would add some more content in an update. Thanks guys! I love this game. I can play this for hours on end, but there are some issues that need to be fixed. First, the mall rankings. Before the most recent update, I could easily rank #1 so I could get the casino. Now, no matter how much money I rack up with any of my stores(after continuously using hold sale every month) I always rank #5. I even got close to making $10,000,000 and I STILL got #5! I don't know if it's the way I'm playing or if it's a bug, but it needs to be fixed. 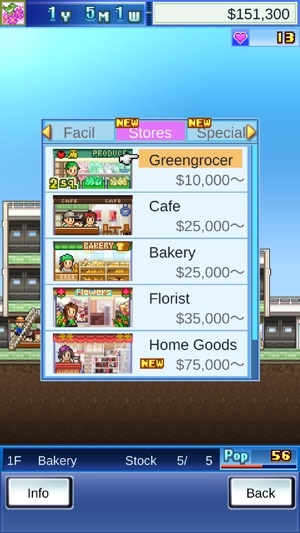 Second, the cost of placing different shops, facilities, hallways, etc. Before the update, if say a hallway costed $1000 to make, that's what it costed. Now, it's far more expensive. Let's say if I make 10 hallways, it doesn't cost $10,000 like it used to. It's more like $250,000 or some other ridiculous amount like that, and the cost INCREASES as I make more floors! This is the same with making shops, adding facilities, etc. I love this game, I really do. It's a nice little distraction for me when I need it. But these bugs need to be fixed. Very cute and fun game with good replayability. 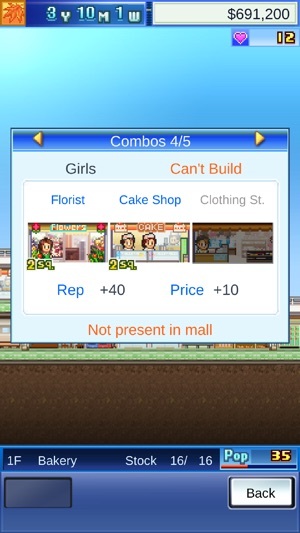 The only suggestion I have is that rival malls should not appear so often after you’ve completed all investment plans as that’s the only way you can get rid of them besides waiting for two years (in the game) for them to go bankrupt. 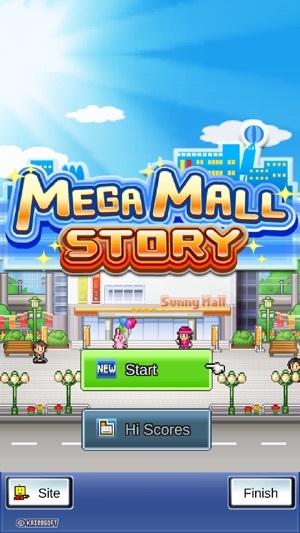 Other than that, Mega Mall Story is a solid app!